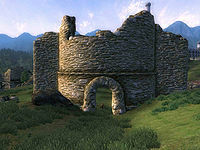 Fort Homestead is a medium-sized fort south of the Imperial City containing marauders. It contains three zones: Fort Homestead, Fort Homestead Passages, and Fort Homestead Heroes' Hall. 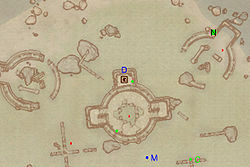 This location's map marker (M on map) is named Fort Homestead (editor name FortHomesteadMapMarker). The entrance door is NNW of the marker, 130 feet away. Another Nirnroot is located inside the circular ruins just west of the entrance. The Nirnroot is just off the map. 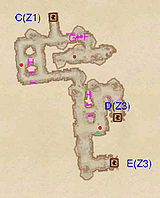 Just northwest of the main section of the fort between two boulders, there is a skeleton with eight bottles of beer and one leveled damage agility poison. This zone is pretty straightforward. There is a side-passage in the first corridor in which a mere nuisance animal is hiding. Afterwards, you arrive at a door leading to this zone's first room. There are two pressure plates here at locations G, although they activate nothing. 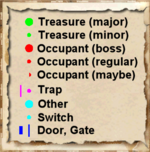 If you go to the left here, you will arrive at the door to Fort Homestead Passages located at C.
If you continue on however, the next room has two enemies and a nasty Dart Trap in the right side of the room. Continuing down the stairs, you should be careful for the Swinging Mace traps just behind the corner to the left, all activated by the pressure plate in this room at G. The last room in this zone is a dead end; you can find an enemy and a treasure chest here. In this zone you will immediately arrive at an intersection. If you go left, you will only find a Swinging Mace trap below the stairs and yet another weak rat. If you go right you will arrive in a room with pillars with a marauder and a Dart trap at the back of the room. The next room is equipped with a dart trap as well. You can choose which way you want to exit this area: To the left or straight from the room. Both ways lead to the Fort Homestead Heroes' Hall, the left exit leads to an unguarded treasure room (Door D on the map) and the other way leads to the main entrance (Door E on the map). There are two ways to enter this zone: from the main entrance (Door E in the map) or from a bridge which overlooks the main hall of this area (Door D in the map). The second way gives a good vantage point to attack one of the marauders, as well as access to an otherwise inaccessible room containing a chest, skeleton, and two pieces of static loot (a Silver War Axe and Potion of Feather). 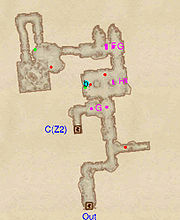 This zone is essentially a large room with a pit in the middle and a bridge across it. The bridge is rigged with some very painful Swinging Mace traps. The best way to cope with them is to alert the enemies on the other side and to let them trigger it. Otherwise you should run with a very high speed across the bridge to avoid the traps. There are three marauders in this room and one of them is this fort's marauder warlord (marked A on map), so you should prepare for a difficult fight, especially since you can alert them at the same time easily. Across the bridge is the boss chest (B) and a bedroll; a good way to heal up after the many enemies and traps encountered throughout the dungeon. This page was last modified on 3 June 2017, at 18:33.